Corporations, and the environments in which they operate, are complex, with changing multiple dimensions, and an inherent capacity to evolve qualitatively. 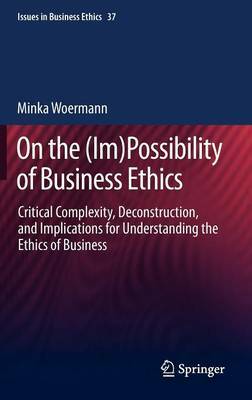 A central premise of this study is that a postmodern reading of ethics represents an expression of, and an engagement with, the ethical complexities that define the business landscape. In particular, the deconstructive philosophy of Jacques Derrida offers a non-trivial reading of a complex notion of ethics, and thereby helps us to develop the skills necessary to critique and intervene in our practices, and to develop robust strategies for living in the absence of prescriptive ethical frameworks. Although a central premise of this study is that substantive ethical claims can only be generated within a given context, the study nevertheless presents readers with a meta-position that illustrates the type of considerations that should inform ethical reflection from a complexity perspective. In order to illustrate the value that this meta-position holds for business ethics, these considerations are explored in terms of the implications that they hold for our understanding of corporate social responsibility, for the practice of responsible management and leadership practices, and for teaching business ethics.